We have been working on Unity WebGL build almost for a 2 month. We are about to release the WebGL build but we had faced a lot of struggle. Due to lack of tutorials or documentation for Unity WebGL build there were lots of stuff we had to resolve. Now we have resolved most of the issues and our Game is working on 2GB Ram (WebGL Memory Size: 400 in Publish Settings) on almost every browser. (Not every unfortunately). Now I want to share my all knowladge about Unity WebGL so someone who stucked or doesn’t know where to start can benefit from this article. I will try to explain most important things for WebGL build step by step and I will try to give important hints. 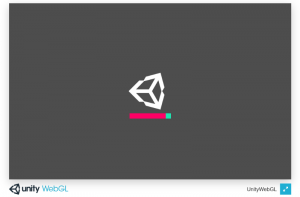 Normally you will see Unity’s default loading screen like below. Now we will change this screen also we will create our own template. So if you are using auto build systems like Jenkins you don’t have to customize loading screen every single time. First of all when you build for WebGL you will see 3 files. First of them “index.html” file. This file lead browsers navigate your content and run it. Second of them TemplateData folder which contains loading screen textures and template scripts. Last of them Release folder. We will change “index.html” file and TemplateData folder to customize and create our own loading screen template. 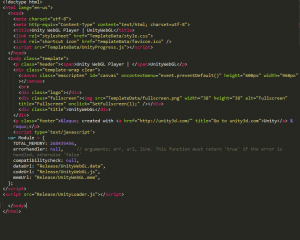 Open your “index.html” file with text editor. This is what our “index.html” look like. Now when we finish creating template we won’t see “Unity Logo” or “Full Screen Logo” on the bottom of the loading screen. Okay we removed the bottom bar. Now I want to make my WebGL build fit as a full screen in every resolution (this works also if you are building for a “Facebook Canvas”). I will add my loading screen a background, progress bar and a text element. Now I will add their reference to my “index.html” file so I can reach them from .css file. Now give a break and prepare your textures. Let’s move on. Open your “TemplateData” folder and remove unnecessary textures (we won’t use them) like “fullbar.png”, “fullscreen.png”, “loadingbar.png”, “logo.png” and “progresslogo.png”. Now copy and paste your textures to this folder. Now rename your background texture as a “backgroundTexture.png”, your loading bar as a “loadingBar.png” and your loading bar inside as a “loadingProgress.png”. Let me make a quick explanation about what this code do. In the above we are finding element references and assign them to variables. In the “SetProgress” function we are assigning loading progress (which changes between 0 and 1) and changing text with “SetMessage” function. “Clear” function removes elements hidden when loading is finished. In “Update” function we are calculating progress and assigning progress bar’s witdh and height. 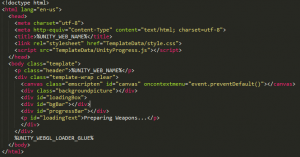 This is our css file which allow us to place our textures and texts in appropriate places. I won’t explain everything in this file so if you have a question you can google about css or send a message to me. Just be careful about “background-image: url(loadingProgress.png);” you have to write exact names for textures (locates on “TemplateData” folder). Now we successfully complete our “Loading Screen Template”. Let’s insert this into the Unity so we can select this template and use for builds. Create a folder inside “Assets” folder in your Unity project. Rename it as a “WebGLTemplates”. Create one more folder and give it a name what ever you want. I will give it “UnityWebGL”. Now let’s look at what we achieved. Inside Unity open “Player Settings” for WebGL and click “Resolution and Presentation” tab. Now you can see one more template as a “UnityWebGL” now select it and build to see your own loading screen. 1-) You can create thumbnail.png and paste it to template folder in Unity. This way you can see what your loading screen look like from Inspector. 3-) You can’t directly open “index.html” file which we create for template. 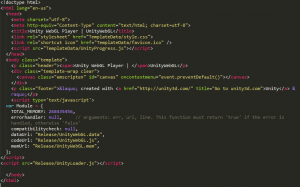 You have to Build from Unity so Unity will insert necessary files to “index.html”. -Because of browser’s will “eat” your user Ram you have to reduce “WebGL Memory Size” as you can. We have succeeded to reduce it 400. -If you have big texture atlas use Unity’s “Asset Bundle” system. Load necessary assets in their places and remove them whenever you are done with them. -Compress all your textures as you can. -Don’t use reflection in your code. -Don’t use “Update” function too much in your code. When you build your project for the first time for WebGL most probably you will encounter crashes. Let’s get rid of them. Firstly and the most important thing is “try-catch” blocks. YOU CAN’T USE THEM IN WEBGL BUILD. THEY WILL CRASH WEBGL IF CATCH BLOCK WORKS. If you are using “try-catch” blocks replace all of them with “null (if)” checks. Interesting thing is here when you get an error on WebGL you want to get “Development” build and see what is wrong. And you will open exceptions to “Full” or “Explicitly Thrown Exceptions Only” from “None”. But you won’t get that error’s again because Unity will place some emscripten codes and “try-catch” blocks will work. AGHHHH! Lastly don’t assign “string.format” variables directly to UI Elements to change sprite via code. First assign them to “string” variable after use this variable for your operations. a-) Download “Firefox 64 bit” browser (Only works in there). b-) Increase “WebGL Memory Size” to 1500. 2-) Clear all Logs (Debug.Log, Debug.LogError, Debug.LogWarning) before building to WebGL for “Publish”. It will increase your game performance believe me. Now Unity will handle full screen operations for you! 1-) Don’t call full screen function in “OnFingerUp” or “OnClick” (NGUI) methods. Because of Unity will handle full screen operations end of frame, so user have to click somewhere on the screen to go full screen. Instead of that listen “OnFingerDown”(Maybe Raycast to specific layer to determine your button) event and call your function here. I will recommend update this plugins to work for WebGL build. If you are using “Facebook Sdk” plugin update it to latest version for WebGL build. If you are using “Photon” or “PhotonChat” update them to Photon 4.x versions otherwise they won’t work. If you are using “Fyber” plugin update it at least 7.2 and update adapters to latest versions. If you are using “Newtonsoft” json plugin update it to latest version. I think they removed reflections and performance is better now. I tried to explain important things for Unity WebGL build. I hope I could help someone who stucks. If you have any questions just sent it to hulusionder@yandex.com and I will try to answer them. © 2019 Personal Blog. All rights reserved.